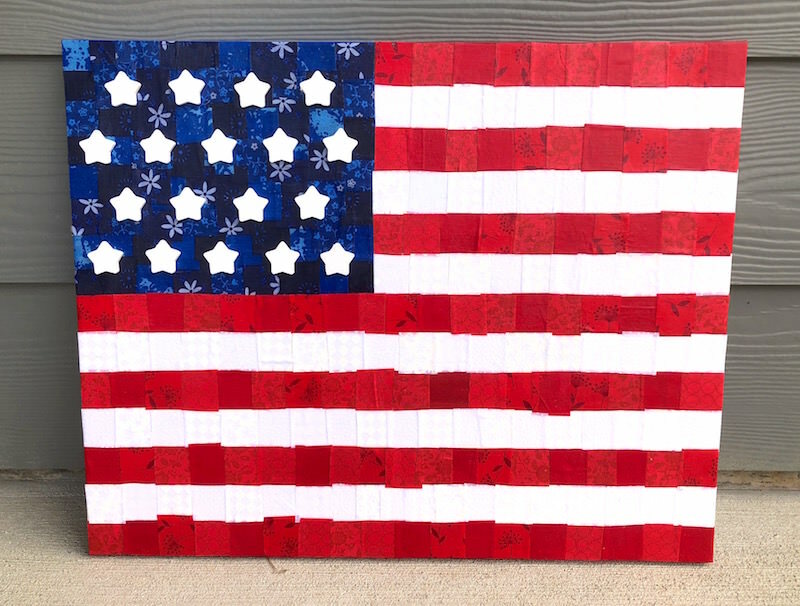 Make unique and EASY American flag canvas art with fabric and Mod Podge! Perfect for the 4th or for just showing off your USA pride. Skills Required: Very Beginner. This project is very easy, even if you've never Mod Podged before. Wrinkles are a concern with beginning Mod Podgers, but that is completely avoided by using such small squares of fabric. You are practically guaranteed success with this tutorial. 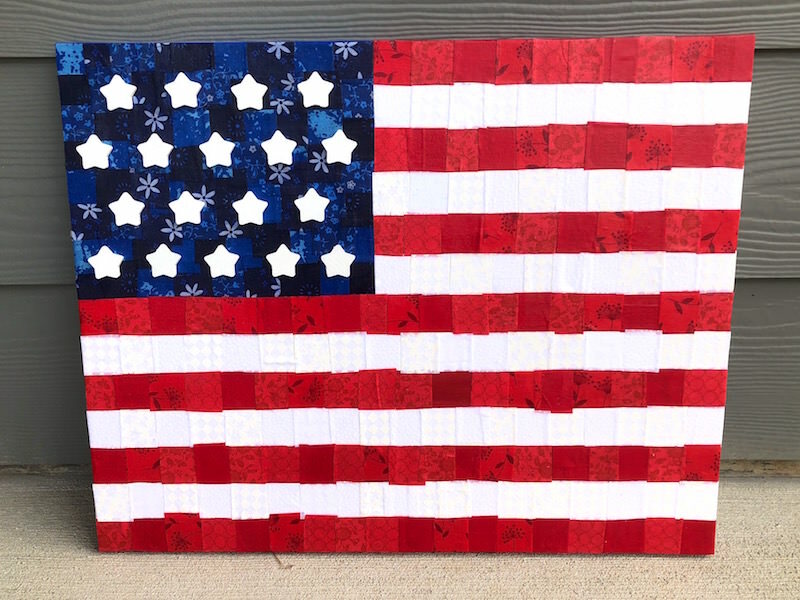 This American flag wall art project is one that I've been wanting to do for a long time! I don't do a lot of decorating for the Fourth of July (guilty), and I wanted something to place out on the front of our house. I'd see an American flag canvas like this one using paint chips, and I got it in my mind that I wanted to do something with fabric in a similar manner. Now I have American flag wall art that I can use year after year! Right now it's not raining so I can keep it outside (it's out of the sun, too), but after the Fourth I'm going to bring it inside to display. It's kind of quirky and kind of fun. 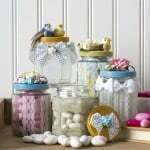 I just love the patchwork effect! In this project I used a 16 x 20″ canvas – having said that, the canvas was not exactly 16 x 20″. This didn't matter for the 20″ length, but the height was important as I wanted to divide the canvas into 13 stripes. A measurement of my canvas put the height at 15 7/8″. 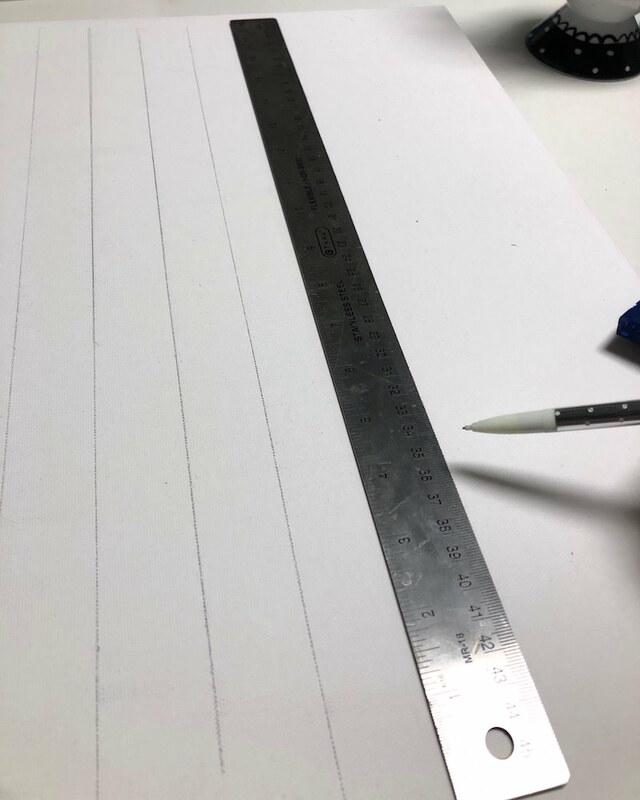 Dividing this measurement into 13 stripes was a pain when using the inches side of my ruler – it came out to 1.22 inches per stripe. You know what I found to be much easier? Using the millimeter side of my ruler! My canvas measured at 43 millimeters, which gave me a length of 3.3 millimeters per stripe. Metric system to the rescue! 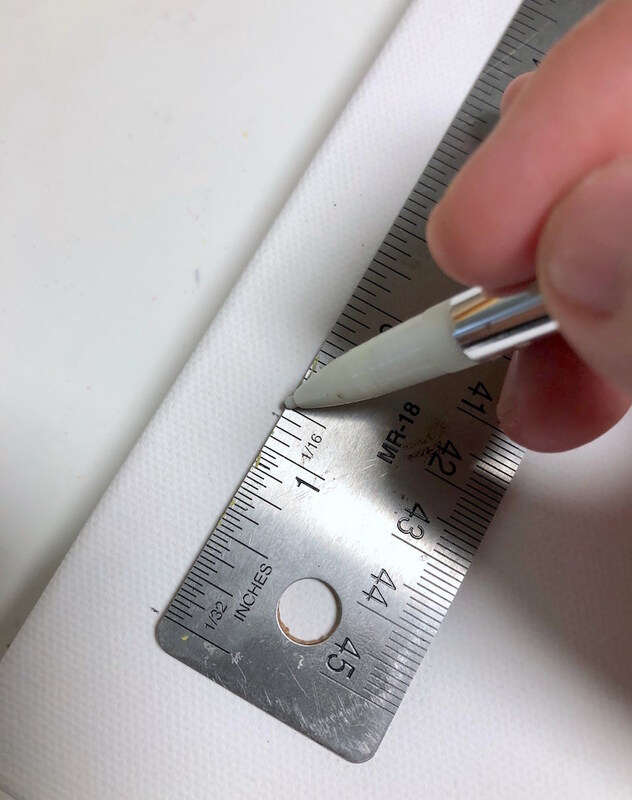 Regardless of the method you choose (inches or millimeters), make sure to measure your canvas and don't go by my measurements. That's because in the manufacturing process, every canvas is a little different. 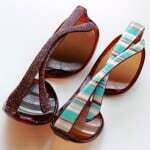 Taking your own measurements will ensure your stripes are relatively even. The patchwork nature of this American flag wall art is nice because it doesn't have to be exact, but you want to get close. Mod Podging fabric makes it somewhat transparent. If you are working with thin fabrics, it helps make the colors pop if you paint behind them. If I missed any areas with fabric (the pieces were too short, for example), the paint filled in the gaps. I wanted to paint around the edges of the canvas as well. The stripes continue on the sides (and top and bottom) as you can see in the photo above. You don't have to paint your American flag canvas – but these are the reasons why I did it. I'll leave it up to you! Are you ready to get the tutorial for this unique DIY American flag wall art? Keep reading! 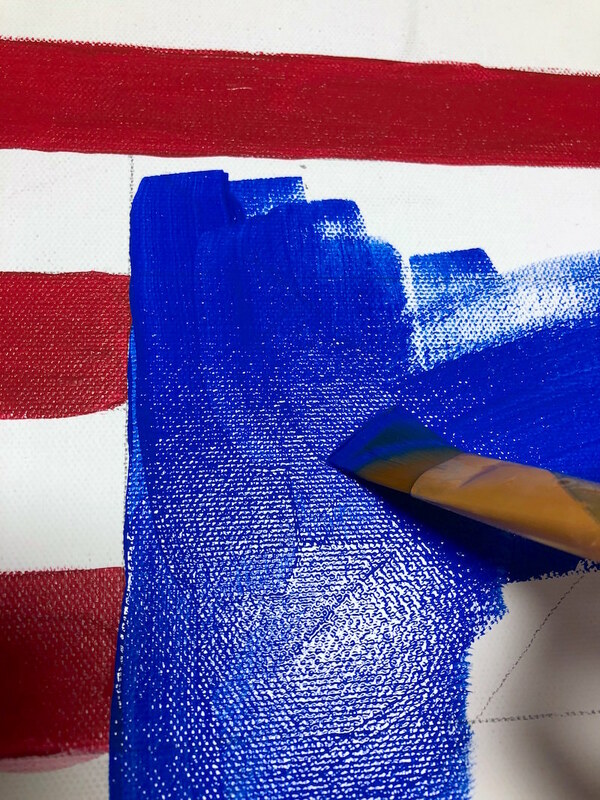 Measure the thirteen stripes for your canvas using a ruler; marking off with a pencil is easiest in case you make a mistake (then you can just erase). 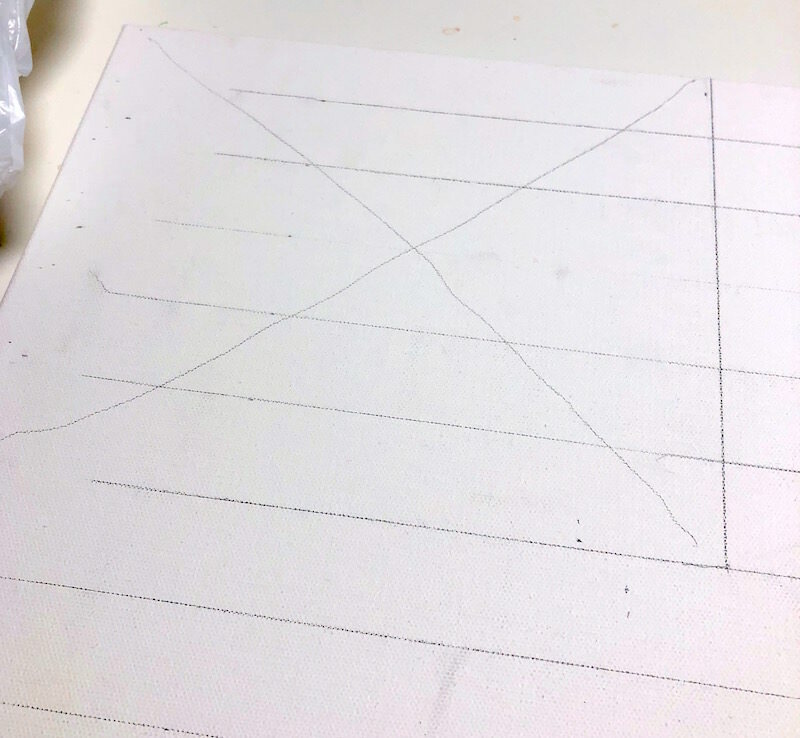 After you've made your marks with a ruler, trace the lines out all the way across the canvas. Mark out the area that you are going to paint blue. I just kind of winged it until I was happy with the proportions. My area is five stripes tall and then 9 1/8″ across. I just wanted it to look proportional to the rest of the canvas. 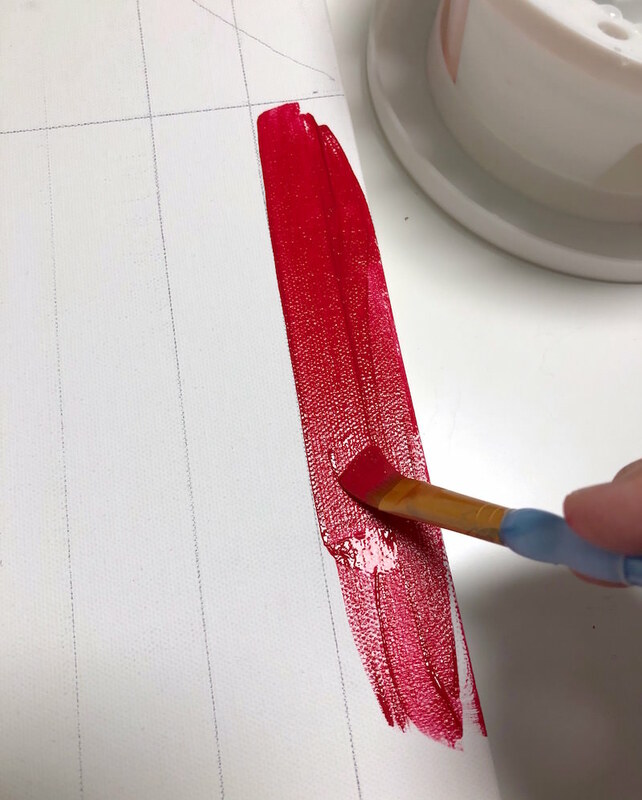 Paint the red stripes using acrylic paint as shown above. I used Engine Red FolkArt. You do not need to paint the white stripes (just make sure any pencil lines that might show are erased). Paint the blue area in with your choice of blue acrylic paint. 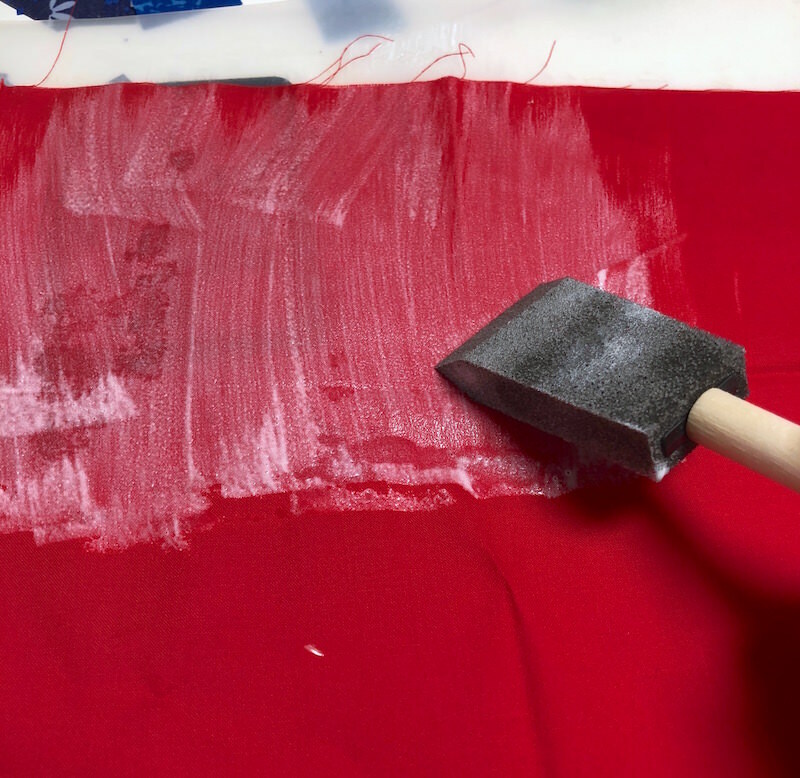 Set the canvas aside to dry and then begin preparing your fabric. 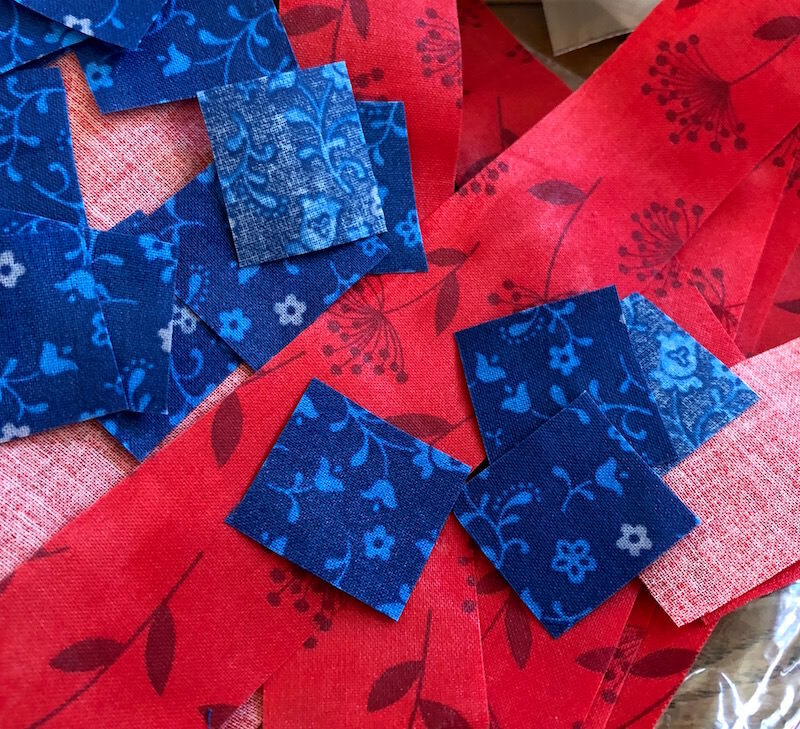 If you have scrap fabric in red, white, and blue – I'm totally jealous. I didn't have any scrap fabric in those colors due to my move last year (I got rid of everything!) so I purchased some fat quarters. I bought about three to four different patterns in all three colors so that I would have some variety. I used about 1/4 of each fat quarter for this project. 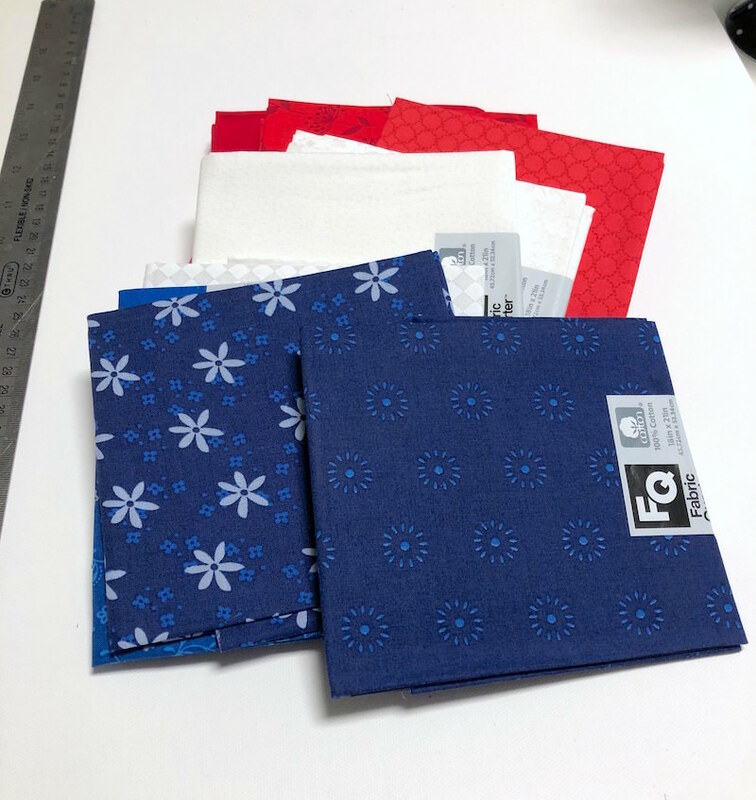 The nice thing is now I have some fabric scraps left over for other projects! I will definitely use them so that wasn't a concern. Next thing to do was prepare the fabric. 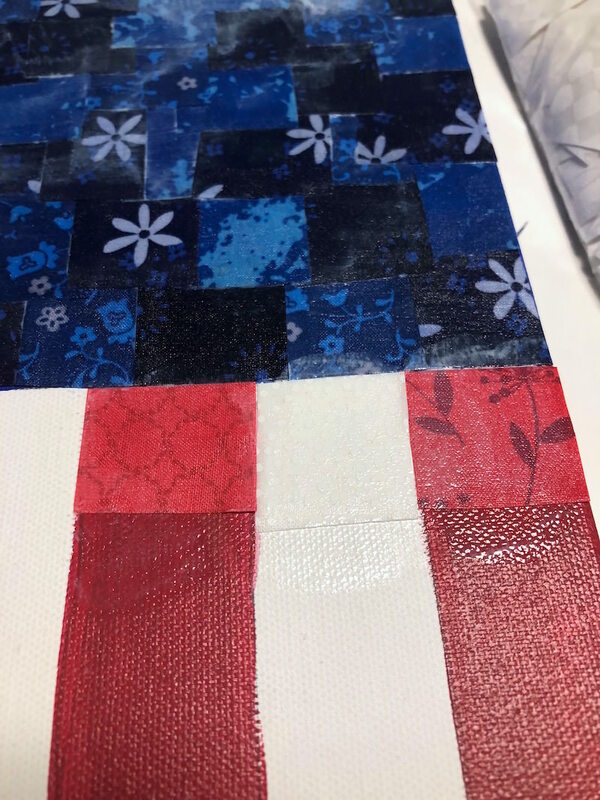 When I say that I “prepared my fabric” for this American flag canvas, that just means I painted a layer of Mod Podge over the fabric (I placed it onto a silicone craft mat first) and let it dry. 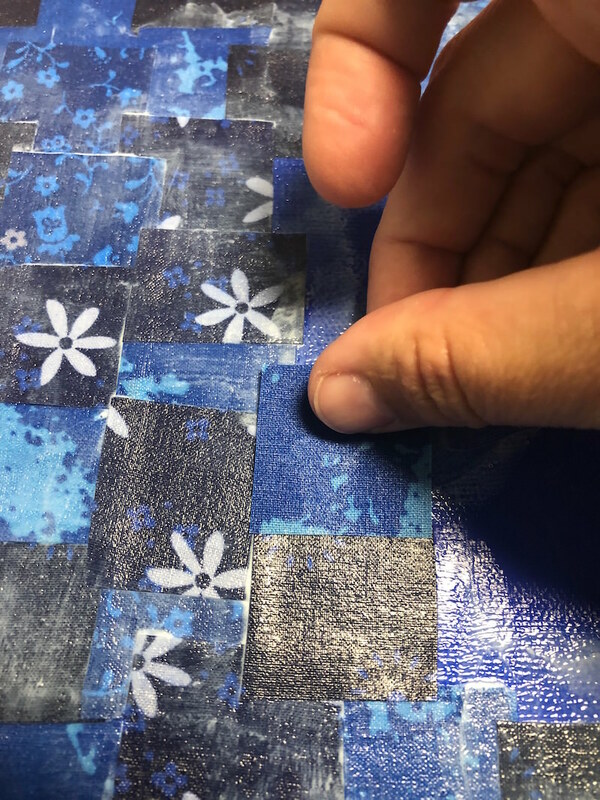 Because it's very difficult to cut fabric and use it in a Mod Podge project without it fraying; especially when the squares are so small. 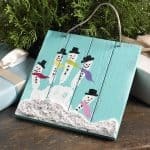 By painting this layer of Mod Podge over the top and letting it dry, you have a more stiff surface to work with that won't fray. Once the fabric is Mod Podged, it's very easy to cut (almost like scrapbook paper!) and very easy to Mod Podge down. 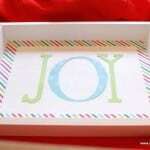 I do it every single time I do a Mod Podge fabric project like this. Yes – it takes more time, but it saves me hassle, and then I don't have to worry about any wrinkling. I overlapped the blue squares a lot more than I did the other squares. 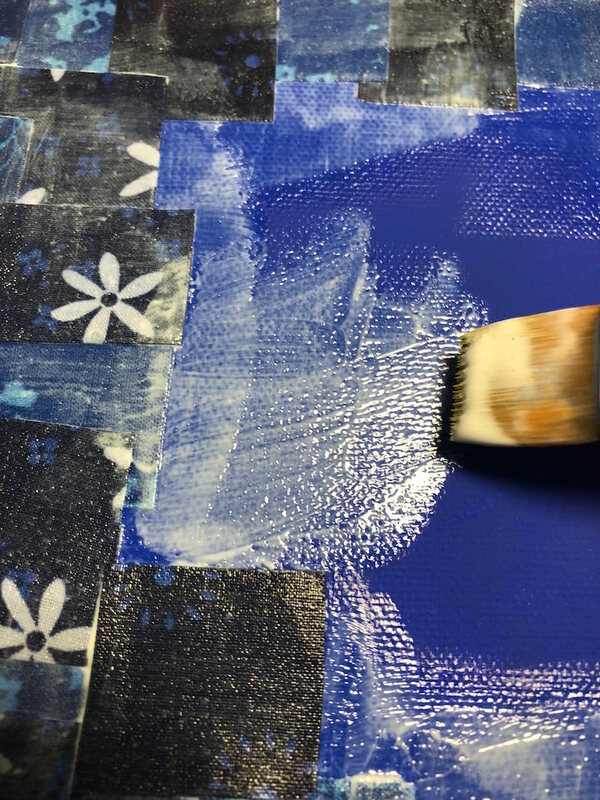 Start with the blue area – add some Mod Podge Satin to the canvas . . .
Then place down a square (you can add some Mod Podge to the back if it's not sticking). Mod Podge right over the top. If it moves at all, just pick it up and place it back. Continue in this same method until the blue area is filled in, then work down the stripes. I used overlapping squares all the way down the canvas until the entire thing was covered. I choose different patterns to mix together (it's harder to see on the white but there are definitely patterns to those fabrics). Then I let the entire American flag canvas dry. 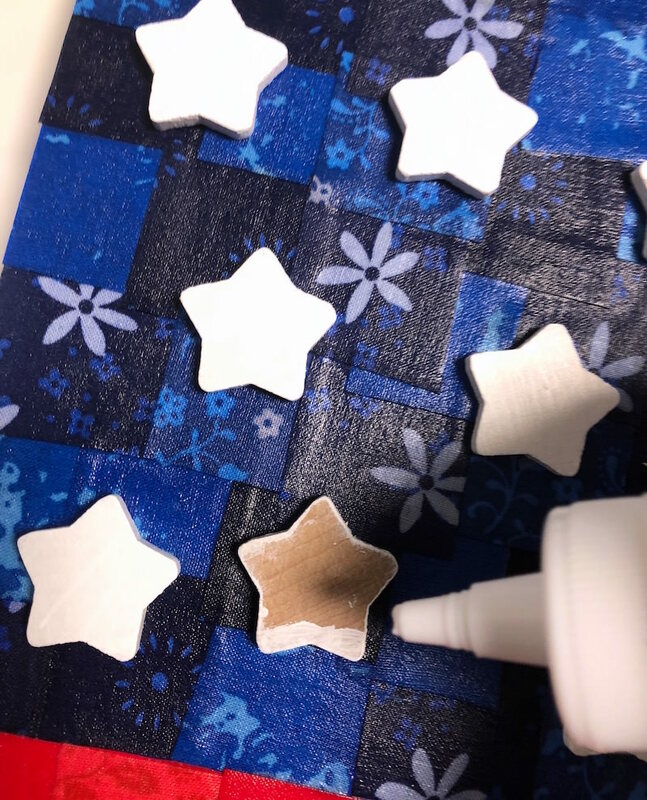 While my American flag wall art was drying, I painted 18 white stars with Titanium White FolkArt and let dry. I would've loved to pull all 50 stars on the canvas but there was only room for 18! 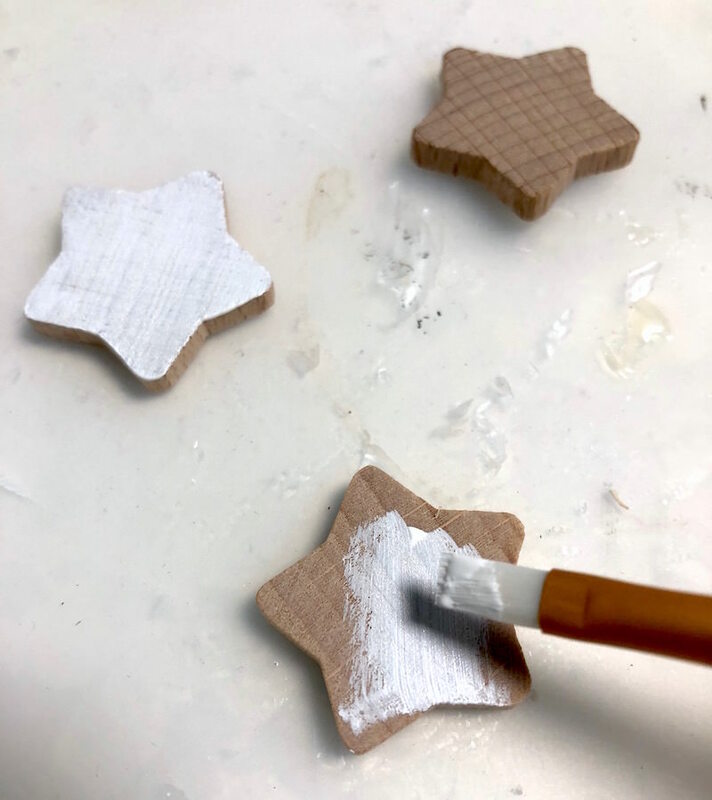 I glued them down evenly using craft glue. 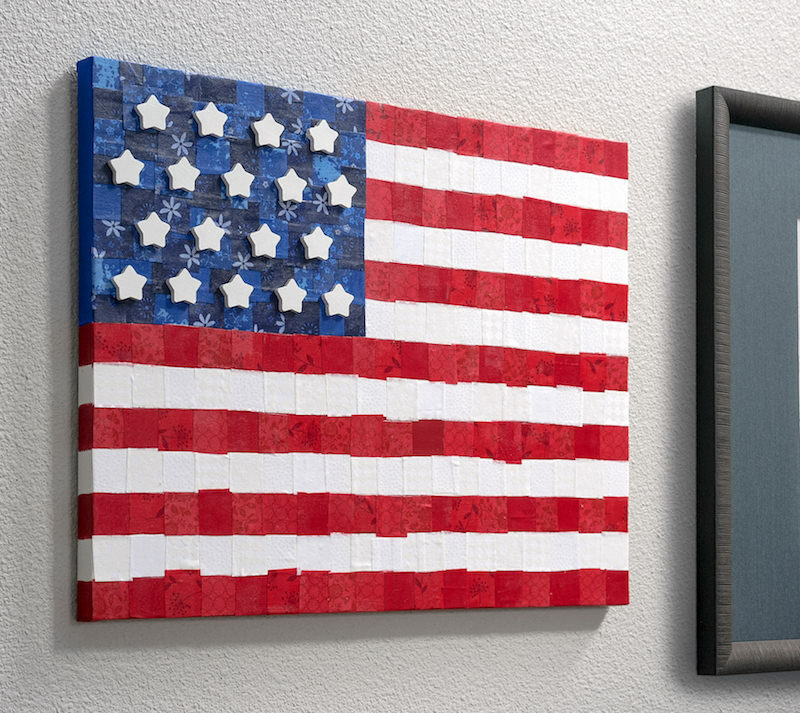 Now that your American flag canvas is complete, you can display it wherever you like! 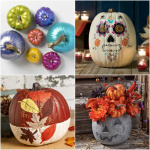 Hang it on the wall or prop it up on a table – either would work. Let me know your thoughts in the comments! Easy Christmas Handprint Crafts: Three Fun Ideas!